The NCAA opposes all sports wagering. This bracket should not be used for sweepstakes, contests, office pools or other gambling activities. But even if you abide by the NCAA's commandment and only enter a bracket pool for fun, you're still wagering something; indeed, reputation or prestige can sometimes have bigger stakes than money. Engaging in even amateur prognostication carries with it the motivation to show others we are right and the threat of eventually being proven wrong. In college, my best friend and I developed our own algorithm for ranking college basketball teams based on their performance during the season. (It's not much different from this, this, or this.) Over the years, I made a decent amount of money sticking to our system, which we colloquially simply called "Mathematics." Year after year, I finished in the money of a large private pool operated by a friend of mine by letting Mathematics predict, say, Georgia Tech making it to the 2004 championship game. Doing the math, sorting the rankings, calculating all the probabilities—it was a huge thrill to me, because I'm a nerd. 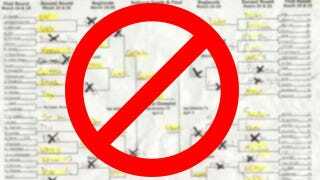 March Madness is my favorite time of year, and the process of building my bracket was a huge part of why I came to love it, even if it meant going without sleep the night after Selection Sunday. This past Sunday, I got plenty of sleep. I didn't do any math or calculate any probabilities or look up 68 teams' offensive efficiency ratings. I didn't go through the process because I'm not filling out a bracket this year, mostly because I didn't do it last year either. Not filling out a bracket last year was mostly accident. I was busy grading midterms and dealing with other work responsibilities, and just didn't have the time to spend six to ten hours doing math. Plus, this 2008 essay by former college basketball writer Kyle Whelliston (one he expanded upon in 2010) had created a small legion of anti-bracket crusaders whose arguments I found somewhat compelling. So I excused myself from my friends' private pool. Come noon on Thursday, with nothing at stake, I realized my relationship to the coming 63 games would be only on my terms. I could root for Arizona because I like watching MoMo Jones (who was a Wildcat last season) play, George Mason because then-coach Jim Larranaga is a great guy, and Butler because I love their bulldog mascot Blue II. I ended up enjoying the NCAA Tournament more than I ever had before. The NCAA tournament is more fun if you don't try to pick any winners. While Whelliston has an agenda in his anti-bracket philosophy, my understanding of the experience is a lot simpler. By placing artificial stakes on each game, you deprive yourself the ability to actually care about the winners for anything but superficial (or ulterior) reasons. Even if the reason you pull for a team to win is entirely arbitrary—maybe you're Catholic so you root for the Catholic schools, or you like the color blue, or you always root for the team operating with the smaller budget—whatever your reason to care about one team over another, it's your reason, and has nothing to do with anyone else. Furthermore, it lets you adapt to the game itself—is the team you supported in the first half playing dirty, punching guys, or holding Satanic rituals at halftime? Switch sides! It's your decision. Removing the artificial incentives that come from prognosticating creates a much more personal experience watching the games, an experience I've found to be extremely rewarding. I could enjoy VCU and Butler shocking the world without worrying what money or credibility their wins might cost me, just as an example. You've probably already filled out your bracket by now, but it's not too late. All it takes to enjoy March Madness on your own terms is to throw away whatever hard copy you have, avoid checking Yahoo! or ESPN or CBS bracket contests during the next three weeks, and if you won—hey, you won. But let your own creativity guide your allegiances during the tournament. Trust me, you'll love it.